Bob the Birder: Whose a Twite? A non birding day, thought about going to watch the Nuneaton Old Eds playing Rugby but by the time I'd made a decision it was past half time and not worth going so I picked up a few leaves in the garden. The problem with going to the Old Eds is that its a very sociable club and I might be tempted to have a pint or two like in the 'old days', I wouldn't then be able to go to the Ridge Lane Brewery and enjoy a pint of Boston Fat Boy which is a beer thats not available very often but well worth waiting for. 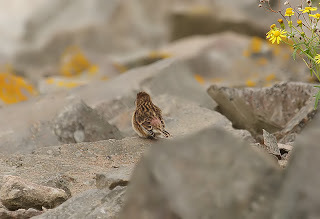 So I thought I'd post another image of the Twite at Draycote water on Friday showing the distinctive pink rump. Bob, I am really impressed with your "grab" pics of the Twite. You will have to let me know your secret!! Well done Bob.I think even I might ID one now.Will it stay around ? Congratulations Bob on turning the phantom Twite into reality.